When dogparkSDR starts, the Registration prefs Local table and the HUD radio popup displays any radios found in your local network not blocked by a firewall. dogparkSDR locates these radios using a network broadcast protocol that is limited to the local subnet of your network. If your radio is turned on and is connected to your local network, it should appear in the popup. The first time your run dogparkSDR you will need to connect to the radio by selecting it in the HUD popup or double-click on it in the Registration prefs Local table.When you restart dogparkSDR it should remember your choice and Auto Connect if you have that option set in the Radio prefs. You may also need to add Panadapters and Slices from the dogparkSDR File menu and select or create a new global profile. All the real magic happens in the radio. dogparkSDR is a native Mac application client window into that world. It takes care of setting and displaying radio parameters, displaying the Panadapter and Waterfall as well as routing the radio audio in and out of the Mac. In other words, dogparkSDR does not define the capabilities of the Flex 6000 series radios - it exposes a subset of them to the Mac user. The central aspects of the UI are the Panadapter and the Waterfall - they are the content that we want to place on center stage. Everything else is just widgets that shouldn't distract from the content. Since dogparkSDR and the Windows client are both designed to control the same server (radio) the SmartSDR for Windows Software User's Guide is a great reference for dogparkSDR users. Parameters that we seldom change are in the Preferences and Main menu. The File and Shortcuts menus contain often used Panadapter and VFO/Slice commands as well as access to the CWX and Memories controllers. 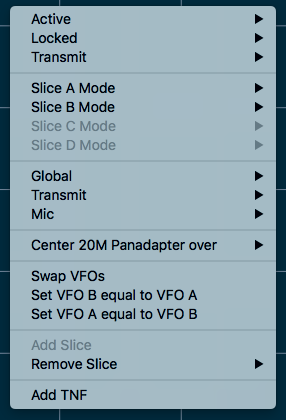 Control or right-clicking on the Panadapter display brings up a contextual menu which provides quick access to VFO/Slice commands. While dogparkSDR doesn't require a specific SmartSDR radio firmware version to run, it is optimized for the latest version and SmartLink requires the radio to be running Version 2 firmware. Note: You will still need the SmartSDR client running on a Windows PC or a Mac running Parallels, or a FlexRadio Maestro to install new radio firmware, purchase a SmartSDR V2 License, save and restore profiles or to setup USB Cables connected to the radio. 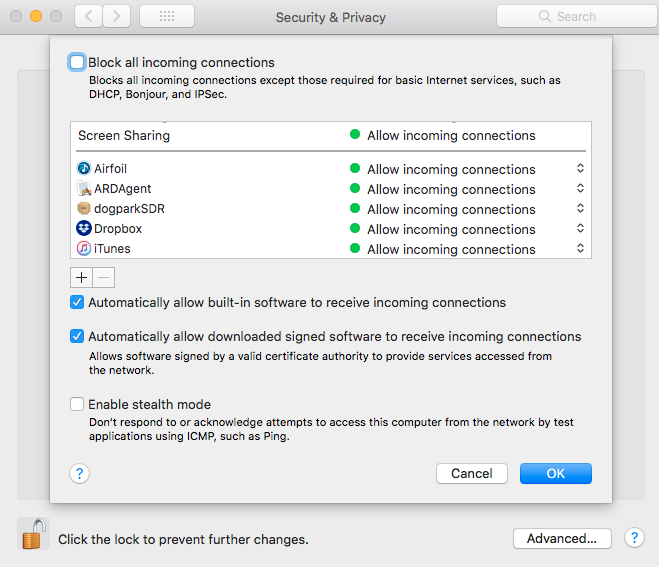 If your Mac Firewall is enabled in System Preferences / Security & Privacy / Firewall, make sure you set it to allow dogparkSDR or any signed application. If you need the SmartSDR client running on a Mac under Parallels to install new radio firmware, save and restore profiles or to setup USB Cables connected to the radio you will need to connect locally not through SmartLink.